Can it REALLY be? A television show about a low-carb diet? YEP! With popular weight loss reality television shows like "The Biggest Loser" in the United States, Australia, and around the world, it was only a matter of time before a television network was gonna be willing to give the low-carb lifestyle an opportunity to be featured and displayed prominently in its very own program. And now it's here for all the world to see for themselves the life-changing impact of healthy low-carb living! Have you heard about the new Canadian show called "My Big, Fat Diet" which premiered on the CBC on Tuesday night at 10pm? Oh my gosh, if you are a fan of livin' la vida low-carb, then hold on to your hats folks--they're actually putting the participants on a sugar-free, no junk food, high-fat, low-carb diet. WOW doesn't even begin to express how amazing it feels to see something like this on television. Based in the Alert Bay area of British Columbia in Canada, the premise of the show is to get the people to return to the native diet of the orginal Namgis First Nation ancestors. With outside influences changing the makeup of the aboriginal community there, the negative impact on the weight and health of the people there has been undeniable with rampant obesity, metabolic syndrome and diabetes. It's a sad state of affairs which is why Métis physician Dr. Jay Wortman, who I have had the privilege of interviewing at my blog previously, took a strong interest in researching and developing a diet program which closely mirrors the one used by the people not that long ago. Most upsetting to Dr. Wortman and like-minded doctors in that area is that the typical diet and lifestyle intervention prescribed to people with the conditions that are being seen in the health of these participants is a high-carb, low-fat diet and hours of exercise. But Dr. Wortman knows better based on the studies he has conducted with his unique approach to improving weight and health issues through the use of a high-fat, low-carb nutritional approach. He blames the cultural influence of the United States on most of the problems the people of his country are suffering from today. "Obesity, diabetes and heart disease were unknown in these populations until very recently," Dr. Wortman exclaimed. "No aboriginal language has a word for diabetes." As a Type 2 diabetic, Dr. Wortman is keenly aware that he needed to make drastic, immediate changes in his diet when he was diagnosed with it four years ago so he could not only survive his disease, but thrive despite it. "My immediate instinctive response was to stop eating any food that caused my blood sugar to rise," he added. "So I eliminated carbohydrates from my diet. Within four weeks, my blood sugar and blood pressure had normalized and I began to feel much better." There was absolutely NO pasta, rice, potatoes, bread or sugar allowed. Dr. Wortman is convinced the introduction of these foods to the culture in the late 1800s is what led to the problems with health that exist today. Avoiding all starches and sugars was the key to the diet plan on "My Big, Fat Diet." It's a very unique concept considering the continued antagonistic attitude held by the media and health "experts" who believe the low-carb diet is a "dangerous fad" that can cause damage to your health over the long-term. I'm waiting for some pompous low-fatty health group to file a lawsuit against the CBC for daring to do such a television show about livin' la vida low-carb. Directed by Mary Bissell, this Bare Bones Productions show follows the lives of six real Namgis First Nation people who willingly give up sugar and starch and replace it with fat over a period of a year with fantastic results. This program is sponsored by Health Canada and the University of British Columbia. 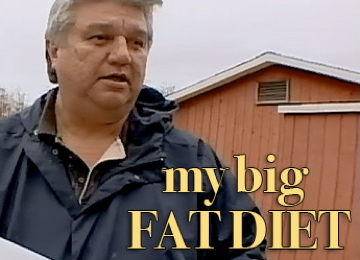 Mixing a bit of historical culture influences with sound documented medical science is what makes "My Big, Fat Diet" the first such program like this in television history. Interestingly, on the official web site for "My Big, Fat Diet" at the bottom of the page there is a big disclaimer that I couldn't help but laugh at when I saw it. "The research in this study is still being evaluated. Anyone taking medication for diabetes or high blood pressure should consult their doctor before starting a low-carb diet." Isn't it funny how we NEVER see these kind of warnings against a high-carb, low-fat diet because we all KNOW how healthy they are. HA! Just you wait and see the outrage that comes when there is so much positive improvement in the weight and health of the people on this show. How will people like Dr. Dean Ornish and his ilk explain away results that speak for themselves? Oh, they'll downplay it as anecdotal and say there's no evidence to support this for others. And yet the lives of these people, like mine and many others who read this blog, SPEAK FOR THEMSELVES!!! I will have the distinct pleasure of meeting Dr. Jay Wortman at an obesity conference taking place in Phoenix, Arizona in April and will try to interview him for my podcast show about his work with the First Nation people and this exciting new television show "My Big, Fat Diet." I've met him once before and he's a really funny guy for a researcher who has turned out some very serious studies on the efficacy of low-carb living. Be looking for that podcast in the next few months. In the meantime, if you live in Canada, then you HAVE to watch "My Big, Fat Diet" and see the remarkable turnaround that happens in the lives of the diet participants. I only wish we could see this show in its entirety in the United States. But you know what? They need to do something like this in America. Why not have a "Livin' La Vida Low-Carb" weight loss reality show, hmmmm? We could get a group of experts like Dr. Eric Westman from Duke, Dr. Richard Feinman from SUNY Downstate, Dr. Jeff Volek from the University of Connecticut, and Dr. Stephen Phinney from the University of California to head up the nutritional plan with consulting from Drs. Michael and Mary Dan Eades, Dr. Barry Sears, and others. Then implore the training assistance of people like Fred Hahn and his "Slow Burn" workouts along with inspirational messages from Dr. Jonny Bowden who could actually host the show and you've got a real recipe for a ratings winner in my book! Sure, I'm dreaming but wouldn't you love to see a show like that one!!! I SURE WOULD! How about it ABC, CBS, NBC or FOX? Do you have the guts to take a chance on a controversial, but very unique television show idea? If you'd like to learn more about Dr. Jay Wortman and the work he is doing with low-carb diets in Canada, then you might want to check out his new blog. You can find out anything you want about "My Big, Fat Diet" as well as get in touch directly with Dr. Wortman. Like I said, he's a very personable guy who is open to helping people understand how living the low-carb life can radically transform your life for the better. It happened to him and now he wants others to experience that same gift. 3-12-08 UPDATE: There's more good news about low-carb featured on television happening in the UK. According to this The Sun column, a 6-part series on Channel 4 entitled "The Diets That Time Forgot" will feature the low-carb diet created by William Banting. "But which diet plan is the most effective? Is it the 1863 phenomenon the Banting Diet (which is essentially the Atkins diet)." WOO HOO! If you live across the pond, then be sure to tune in to Channel 4 at 9pm beginning on Tuesday, March 18, 2008 for "The Diets That Time Forgot." Could we be getting closer to programming like this coming to the United States? Cross your fingers! You envisage a show with changes in diet, exercise and "inspiration", but this is the same mish-mash that makes Dr Ornish's results contestable. There should only be the low-carb intervention - otherwise critics will say, "it was the exercise ... it was the motivational pep talks." It's SO great that they're doing this! There's one no-apologies low carb show that I know of on Fit TV here in the U.S. - it's a cooking show. You just struck gold Jimmy! -- This is the one we all needed to hear, Gary Taubes included. This thing will sweep through the tribes like a duck sweeps through water. A traditional diet answers this whole problem for all races the world over. These Native Americans are prime examples and this doctor has discovered this truth and is bringing it forward. Oh Happy Day! I rest in peace! Dr. Atkins had it and you had it and now the Native Americans have it. The war is won, it's just a matter of time until the world sees this living proof we have so badly needed! It also cures alcoholism and a lot of mental disease! Oh Happy Day! Congradulations on a job well done Jimmy, keep up the great work, you are a savior! WOW! This is great news! Now if only network television in the US picks up on this. Come on, Canada, send your ratings through the roof with this one so we can get our own Big FAT Diet on television! WHOO HOO - thanks for posting this, Jimmy! THANKS Chainey! But whether the exercise and inspiration is explicitly stated or not on a low-carb show like this in America, the critics would STILL give credence to everything besides low-carb first. It is what it is and any lifestyle change worth its salt involves a comprehensive total body approach. Hey Tara, what show are you referring to? Unfortunately, Fit TV is NOT a major channel in the U.S. We need a network like one of the four biggies to pick up on this to have a REAL impact. You got that right, Trish! This new show should get KILLER ratings and give American producers something to consider. You *need* to get YOUR facts straight before posting them on your blog. This is NOT a 'new lowcarb show' as you posted on your blog. This was a DOCUMENTARY shown on a Canadian show called 'The Lens'. A show which has been running on the CBC for YEARS. Please correct your blog. Steelheart, how does this change anything I wrote in my blog post? The bottom line is this is a TV show about how a high-fat, low-carb diet is changing the lives of real First Nation natives. If it's been on television longer, then that's fine. Here's the link for the Low Carb cooking show (Blaine's Low Carb Kitchen). I totally agree that it's important to get the word out about low carb, but I worry what would happen if big tv channels and food companies decided low carb was the new low fat. Its so amazing. They could never put this on TV in this country. The people with the big money ( Pharmaceuticals ) would prevent it. They would say you run this story and we'll pull our ads. What a great title, "MY BIG FAT DIET". What a great story. This whole diet thing is a lot like good and evil. Fat, good. Carbohydrate, mostly evil. The medical establishment, evil. They are making and keeping people sick to make money. Its all about greed. This story is also my story. It hits home with me. I cured my diabetes and high blood pressure with the Atkins diet. THANKS Tara! I previously blogged about Blaine Jelus and his show being canceled on Fit TV because "low-carb is dead." Makes you wonder if they'll bring back shows like this as livin' la vida low-carb becomes much more mainstream as it has in the past year or so. It's coming! As for the companies thinking low-carb is the new low-fat, that's already happened in 2003-2004. The whole "low-carb craze" created this horrible glut of nasty products that purport to be low-carb. They very clearly were NOT. I'm working on a blog post to define what I mean when I say "low-carb" to clarify it for people like Dean Ornish and others who want to pervert it. AMEN, Carl!!! Let them put people like me and you on television talking about how a high-fat, low-carb diet has revolutionized our health. Wouldn't that be amazing? "Dr. Jay Wortman was featured in a television documentary on a visionary diet approach he developed for aboriginal people. 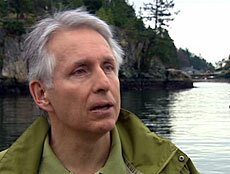 The TV show first aired this week (Tuesday, March 11) on CBC Newsworld." So, as you can see, this week's episode which I blogged about was the FIRST TIME it has aired on television. While I can appreciate you wanting me to be accurate at my blog, please do not publicly berate me about facts when yours are very sketchy at best. Now we need one here in the good 'ol USA! Jimmy Moore should host it! If not on NBC, then TLC! I know I would watch! I do notice that they cook quite a few low carb dishes on Food Network, too, including using lots of healthy fats like butter and olive oil, but unfortunately, they don't really do low carb desserts and that kind of thing. Thank goodness for all the people out there in cyberland who are sharing recipes! It seems that there are so much more of these high quality foods available in my area now than ever in the last 20 years. It's thanks to people like all of you who are making your dietary desired heard. I saw the CBC documentary "My Big Fat Diet' last night and it was one of the most exciting things I have seen in a long time. Dr. Jay Wortman's commitment and patience shines through the program. I can hardly wait to hear Jimmy's next interview with him. I hope you folks down South are able to see the documentary soon. It has left me re-inspired as a dedicated low carber and wild foods enthusiast. Jimmy I want to congratulate you again for being right there on the cutting edge with this and getting all of this information to the public! There is no doubt in my mind that history is being made right here. -- Dr. Wortman is taking this whole process to a whole new level, following quite accidentally, in Dr. Atkins footsteps, if you read his story. -- Dr. Wortman has you right there at the top of his list and deservedly so. -- I congratulate you both. -- Millions, if not hundreds of million of lives are being saved! Tara, I notice most cooking shows and cook books show a lot of low carb foods. I think it's natural when you are cooking from scratch unless you are baking. There are few things in my Julia child book that I can't cook as is or make low carb with only one change. I liked the show, but I dont think they emphasized physical activity enough, and they would have all lost more weight and been healthier. Look at the fishermen who were dragging the nets in the rivers looking for those fish they use for oil. they were all lean and didnt appear to have weight problems. I've been on low-carb via the TNT Diet and i'm very happy with the results so far. Put together a proposal for a show & approach BravoTV, FitTV, and FoodNetwork (among others). Bravo is constantly doing "weird" shows. I'm glad to see Dr. Wortman's work with the First Nation is being paid attention to and not forgotten, it promises to be groundbreaking. I hope they closely monitor what is actually eaten and check the blood work, too. Sometimes the blood work is really the most important part of this. can this be bought anywhere now? i must see it! THANKS Star! Yes, the DVD of this documentary is available now as I posted at my new blog. I appreciate your comments.